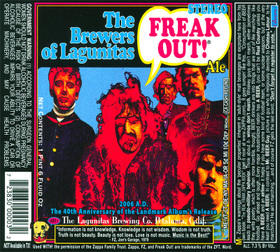 Spotted today at the Fairway in Brooklyn: The Brewers of Lagunitas "Freak Out" Ale, commemorating the 40th anniversary (as of 2006) of the legendary Mothers of Invention LP. The Lagunitas brewery is in Petaluma, CA -- not sure if it's gotten any distribution in the Southland, but I haven't noticed it yet anywhere around L.A. I'm guessing it won't be on shelves much longer. However, with this month marking the 40th anniversary of Lumpy Gravy's release, it's an opportune time for a new Ben & Jerry's flavor. Posting this for no other reason than IT'S WONDERFUL: Laughing Squid gives us a YouTube embed of an ancient live-action Jim Henson short film called Time Piece. I'm curious about the "eighteen-month run" IMDb says it had in a Manhattan cinema. Which theater, and did it preface a feature presentation, as cartoons and newsreels once did? Or was it just shown at MoMA as an ongoing exhibit? Dislocation in time, time signatures, time as a philosophical concept, and slavery to time are some of the themes touched upon in this nine-minute, experimental film, which was written, directed, and produced by Jim Henson-and starred Jim Henson! Screened for the first time at the Museum of Modern Art in May of 1965, Time Piece enjoyed an eighteen-month run at one Manhattan movie theater and was nominated for an Academy Award for outstanding short subject. I wouldn't be surprised at all if these other shorts are on YouTube as well. Guess how I'm going to spend my Christmas! Minor Threat Sauce: Goes Well With Circle Jerk Chicken? "We have no plans for a Bad Brains dip," Orren said. So as not to be accused of undue sexism, I thought I'd throw in a bar where men can fall victim to the female version of the unemployed industry jerk. This lonely little watering hole on a desolate stretch of Venice…	plays host to douchebags from either side of the gender line, and its female regulars will stop at nothing in their pursuit of a one-night stand. Once I was here with a male friend, and a girl he wasn't particularly interested in kept following him around, and when he didn't respond to her advances she threw a bottle at him. It shattered loudly, attracting the attention of the bouncer, and my friend was thrown out in the ensuing chaos. She may very well still be there, which is as good a reason as any not to go. Siel at Emerald City for "enviro-grinching." I'll try to keep the grinching to a minimum.